I understand Steven's desire in this episode to figure out his magical destiny, but Rose told him during Lion 2 Straight to Video that him getting to be human and all the wonderful things that humans get to be is his destiny. Rose's junk yard.. are those pink arm ships or pink leg ships? I confess, it looks like legs bent at the knee to me, but my brain might be in the gutter. I love how irritated Lion was with Steven through out this whole episode. Like, Lion knows that Steven is pursuing a fruitless goal; that he already has his answer. A lot of fans are a bit eyerolly over this episode because clearly Nora was the name for Steven if he was a girl, and Steven should be smart enough to figure that out.. but I like to believe Steven is still a bit freaked out over Greg being Dadnapped and learning that his mother shattered Pink Diamond. I'm willing to put him in the not-thinking-straight pile. I saw a picture on Reddit that showed how the pink "legs" could be two knuckles of a hand/arm ship, which actually makes more sense when you look at the relative size of the diamond's arm ships. They're definitely supposed to look like legs from a symbolism perspective, though. Poor Steven, wanting so hard for there to be a reason for his existence. I like to think of Steven as a reincarnation of Rose as much as a son. Rose has always had a strong affinity for life as it exists on earth (maybe the Rose Quartz gems were originally designed to exploit and weaponize this life, the way Lapis Lazuli(s) can use water). Steven is the ultimate way for Rose to experience living first-hand, which is essentially what she tells Steven in the video. The whole tone of the episode is sort of "hey, tone it down with all the demands for lore" which is kind of funny, given how in the next few episodes we're set up to potentially learn a lot more about Rose and the past from a... very different perspective. My son and I absolutely love this show. it's hard to speak about this episode in light of the rest of the recent bomb, except to say, of course Steven needs to explore what he believes is his purpose in life. Like any 14 yr old, it's not going to be what he thinks it is. As ever, I can't do justice to this quality episode, but I will say that my ludicrously tweeesty, suspicious brain makes me suspect that some random nithling with implausible access to a VCR will have somehow pre-watched that tape and decided that she's in fact Nora and therefore implicitly Steven's Nemesis. Umm, can Lion operate a video? No? That's good! The whole tone of the episode is sort of "hey, tone it down with all the demands for lore"
Yeah, the running through the secret gate only to find it was just part of a wall seemed like a very clear message along the lines of "You might not get all the explanations about stuff we've hinted at before the end of this show." I'm sure we'll get some, but this episode seemed a straight up reminder this is a show about Steven figuring out Steven, not necessarily the whole history and economics of the gem empire. WHAT IS IN THAT CHEST THO. 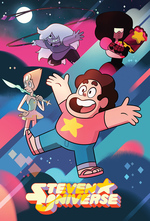 I definitely saw "legs" and went "Damn Crewniverse!" But: if it's an Arm Ship, is it something Peridot + Pearl can fix up? They lost their Ruby ship, and I have a feeling they might need one sometime soon. Still no White Diamond mentions. Still no Pearl backstory/how she met Rose (we have Greg's and Garnet's met-Rose stories, and a pretty good idea of Amethysts). Steven's angst is sweet and yet tiresome exactly like all other teen angst, A+ for realism. We have yet to even see a Gem that belongs to White Diamond, much less hear explicit mention of her. The only clue we have to her existence is the era 1 and era 2 homeworld logos. For that matter Pearl is the only gem we've seen with a Pink Diamond in the episode where she puts on her "spacesuit". Presumably Peridot and Pearl would be able to fix and operate a pink hand ship, if anyone other than Lion knew where it was. I also read on Reddit that the handships might actually be grown, and the wrecked junkpile building might have been where the ship's growth process was being monitored. What if White Diamond is the fusion of PD, BD and YD? CMY color addition and all that. Homeworld gems only fuse with gems of the same type, right? What if they can't make WD anymore?